Boxershorts that strive for a better world! At Teckel-wear we ask ourselves how we could contribute to a better and cleaner world. Every day you get confronted with environmental pollution, animal abuse and other social problems. However, at Teckel-wear we prefer to think in solutions instead of problems. The message we want to bring to our customers is that you can make a difference by wearing an everyday item. We think there is a solution for every problem as long as there is sufficient research and enough financial resources available. Many organizations worldwide have found an innovative way to solve a lot of these problems but simply lack the financial resources to realize them. From this believe we have founded Teckel-wear. We have developed a stylish and sustainable boxershort to support those organizations that strive for a better world. Teckel-wear is a Dutch clothing brand that helps charities reach their goals through selling sustainable boxershorts. Currently we support 3 different charities that clean plastic from the ocean, plant trees in Bolivia combined with educating farmers how to farm in a more sustainable way. The third charity we have partnered with helps abused/neglected animals in The Netherlands. Our boxershorts are designed in such a way that the unique pattern and colour combination perfectly represent the cause you support. Next to the charity that you support, we make sure that our boxershorts are a great fit, provide comfort and are easily washable. We agree that business and sustainability go hand in hand. This is the reason why we make use of the finest cotton and make sure our sewers get paid a fair price. The factory we are working together with is located in Istanbul and works under the Fairtrade Textile Production Standard. One of our core values is that no plastic is being used in our entire supply chain. So, the journey from factory to the end-customer is completely plastic-free. We always send our products in a 100% recycled box. The information paper that is included in the box consists of two thin papers with myosotis seeds in between. The thin paper is glued together with potato starch and the ink used is based on water. After reading this paper you can plant it and a beautiful plant will appear. In 2018 two friends, based and living in Amsterdam founded Teckel-wear. The inspiration for Teckel-wear came from the vision that an everyday product could contribute to the well-being of society, globally! 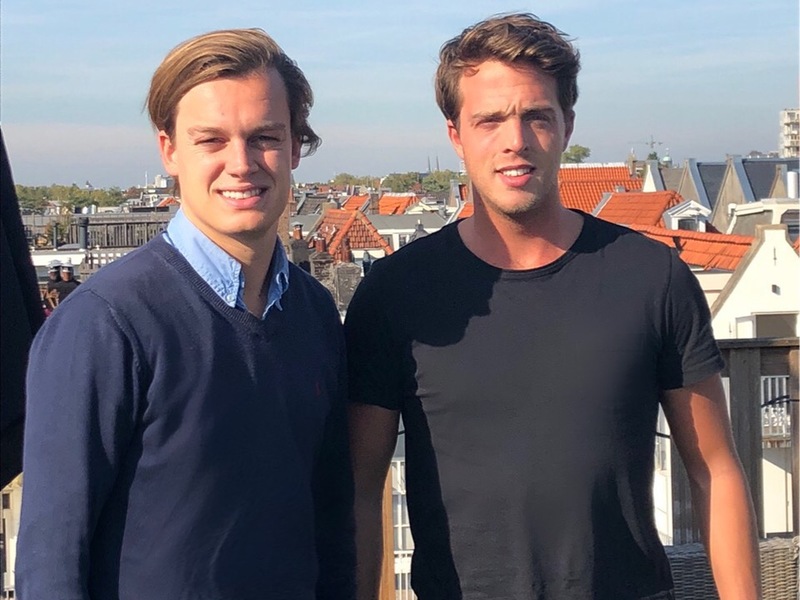 In 2017 I (Lucas Molenkamp, right side of picture) left The Netherlands for 8 months to complete an internship at a social enterprise in the Philippines. During this period I had the opportunity to work for an organic silk factory located in Angat, a rural town close to Manila. This factory is called ‘Ambension’ and is part of the ‘Gawad Kalinga’ group, a start-up incubator for social enterprises. Ambension laid down its focus on changing the way textiles, specifically silk, are manufactured in the Philippines. The current system creates a disconnected value chain with farmers not connected to the final product at all. Ambension encompasses the entire value chain of silk in singular locations to spread any wealth generated to all parties involved. This includes improved farming methods to diversify the value of cassava and castor pants all the way to artisanal silk manufacturing providing flexible livelihoods for our silk production specialists. One of the reasons I chose to do my internship in the Philippines is to increase my sensibility to the occurrence of social injustice in this part of the world. By developing this sense I knew that it had a direct influence on my maturity and critical thinking. After I completed this internship I came back to the Netherlands to finish my study Social Entrepreneurship in Amsterdam. However, the feeling of working in a social enterprise and adding value to people’s life by creating sustainable clothing triggered me to start my own social enterprise as well. We think transparency is a key factor in the succes of our social enterprise, that's why we are happy to provide some background information. At the moment launching two new designs is expensive for us. Since we do not have the financial capacity (yet) to order big quantities we aim for the minimal order quantity. This means we pay a premium price on the production costs. At our factory the current minimal order quantity is 1200 pieces, we divide this in 2 designs, so 600 pieces of each design. Also, Before every order we ask for multiple samples to ensure ourselves, and our customers of the highest quality possible. It is our core believe to never settle for a product that is not perfect, we will not be compromising on quality to save time. Because our order quantity is still low at this moment production time can take up to 70 days. Delays and unexpected shortages can occur. When this happens, we'll make sure to inform you quickly and solve the problem. Next to the three different boxershorts we currently offer we would love to launch two new designs. These new designs will be connected to two new charities. For one of the charities we already have an idea in mind. This one will be connected to a Dutch organization that battles elephant poaching in Kenya. We agree that the safety and protection of these animals is an absolute necessity nowadays. Therefore, this cause is listed high in our priorities. 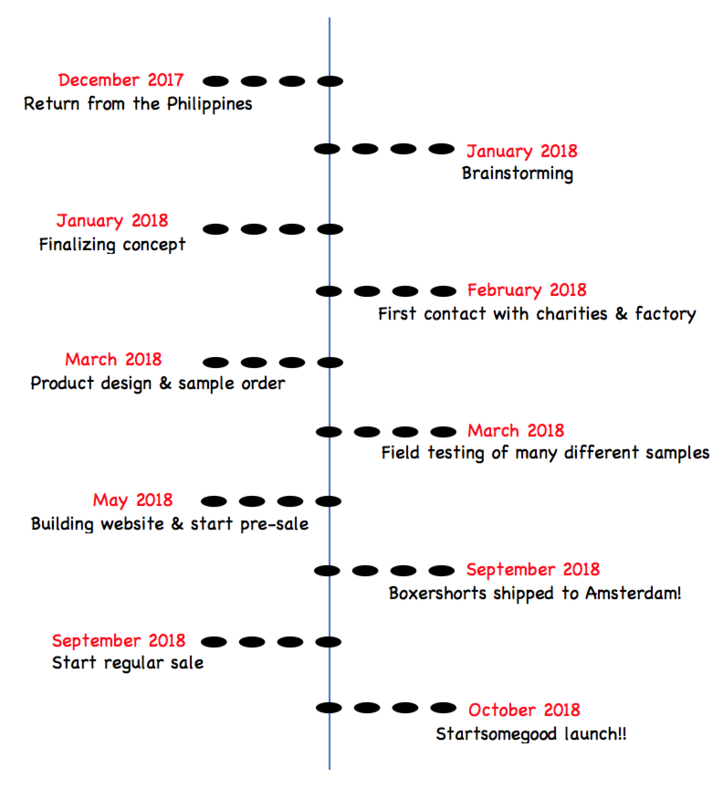 Since our slogan is "Dutch design, Global impact' we would like to connect ourselves to an international charity as well and really pursue the dream of creating global impact. However, we would like YOUR help with deciding the 5th design and charity linked to it! We are very open towards suggestions. We think transparency is a key factor in the succes of our social enterprise, that's why we are happy to provide some background information. At the moment launching two new designs is expensive for us. Since we do not have the financial capacity (yet) to order big quantities we aim for the minimal order quantity. This means we pay a premium price on the production costs. At our factory the current minimal order quantity is 1200 pieces, we divide this in 2 designs, so 600 pieces of each design. Before every order we ask for multiple samples to ensure ourselves, and our customers of the highest quality possible. Because our order quantity is still low production time will be around 70 days. We always choose the best fabrics available on the market to create our underwear. Also, we are aiming to use organic and recycled cotton whenever we can. Currently our factory works under the Fairtrade Textile Production Standard. We make sure that the working conditions in which the boxershorts are produced are fair and decent. Delivering an ethically made product is what we can and what we already do. On the other hand, we are a social enterprise with ambition to climb further up the 'social ladder'. If we reach our stretch goal we would love to swift to 100% organic cotton. This type of cotton is referred to as 'GOTS-cotton'. We dream of using this type of cotton because it is the most comprehensive and highest standard for fabric creation from seed to printed cotton. Thank you for your donation. We will donate $1,00 to each of our charities. Thank you for making the world a little bit better! Thank you for supporting our project. We will use this money to realize the growth of our organization and to partner with more charities. You will receive a handwritten thank you letter! Choose one of the three boxershorts we currently offer and decide which size you want (S,M,L,XL). Also, the charity you support depends on the design you choose. You will directly contribute €2,50 to the linked charity. Make sure you are the early bird! Choose two of your favorite boxershorts we currently offer! The charity you support depends on the design you choose! You will contribute €5 in total to charity that matters! 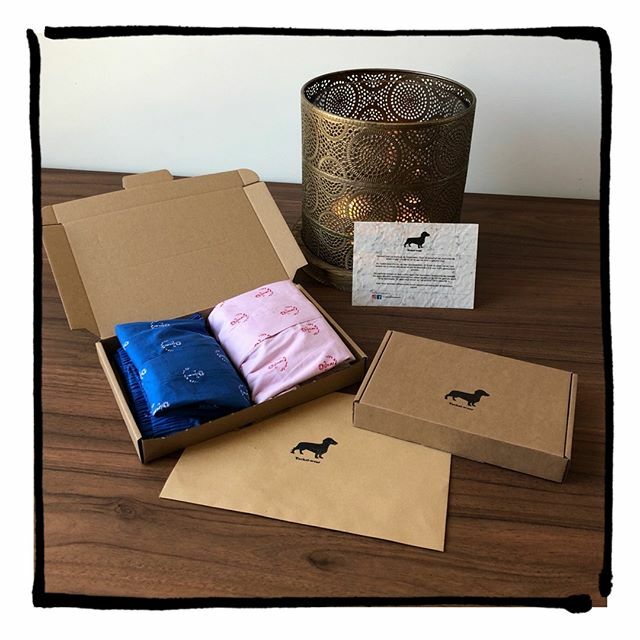 By purchasing this boxer giftbox you receive three boxershorts and support the three linked organizations, namely 'Dierenlot', 'By the Ocean we Unite' and 'Trees for All'. 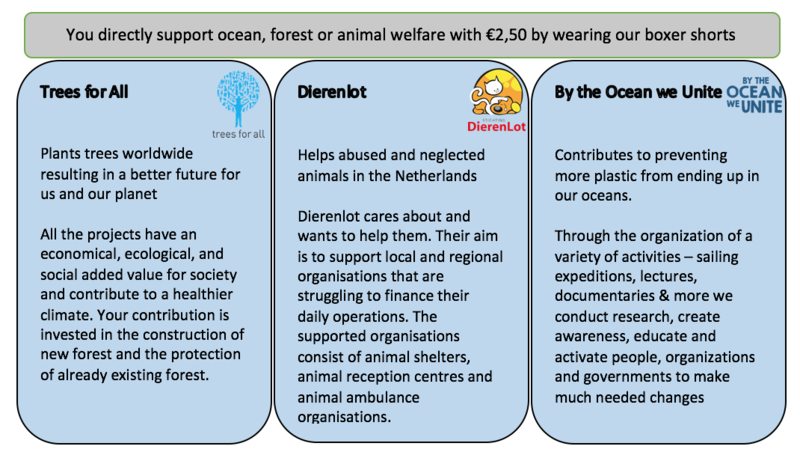 You will donate a total of €7.50 of the purchase amount to all these organizations. Having a hard time finding the right boxershort for the right day? We have the solution! A box with 7, 100% cotton boxershorts that strive for a better world. Hesitating what to wear will never be a problem anymore! By purchasing this box you directly contribute €17,50 to the linked charities. This boutique reward will provide you with 35 boxershorts and a cool display to promote them in your store! Be the first of your region with our boxers in your store and make sure you are the early adapter in your city. Also, by purchasing this reward you have a direct influence in the decision making of our future designs. Looking for a responsible Christmas gift to either your organization, , Christmas party or a big event? This box provides you with enough boxershorts for half a year without doing laundry! By purchasing this box you directly contribute €455,- to the linked charities. Also, by purchasing this reward you have a direct influence in the decision making of our future designs.